Practicing your guitar makes you a better guitar player. Understanding guitar wiring makes you a better Tone Wizard. And, properly grounding your guitar’s electronics makes your guitar as quiet as it can be. In today’s article, we will delve into the world of grounding: The basics, common myths, and best practices! A Ground (or Earth) connection is a term that relates to a multitude of topics related to electrical engineering. For our intents and purposes, a proper Ground connection is an essential part of your guitar’s wiring. A Ground Connection connects every piece of metal on your guitar and acts as a return path to the amp. In part, the Guitar’s Ground Connection helps remove unwanted noise, and is essential for safety – It allows electricity to travel safely to the amp to dissipate. Your guitar is surrounded by many things that emit or produce EMI, or Electromagnetic Interference. Look around you – you’re probably in front of a computer, near some lighting, and most likely close to some electrical lines. These are all sources of EMI, and there are thousands of them all around us. Your guitar will pick up a multitude of these. However, if you properly ground your guitar, you can get your guitar as quiet as it can be (single coils will still hum), and not introduce sound via improper grounding. Definitely not. 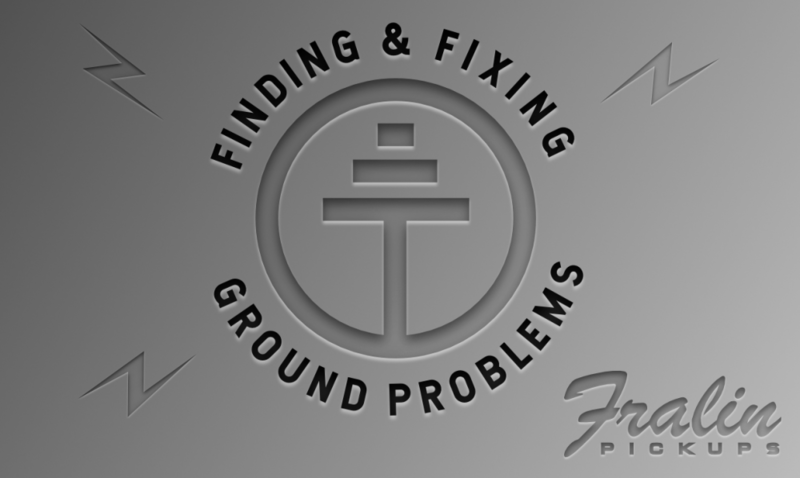 Proper grounding means it only needs to connect correctly to the ground once. 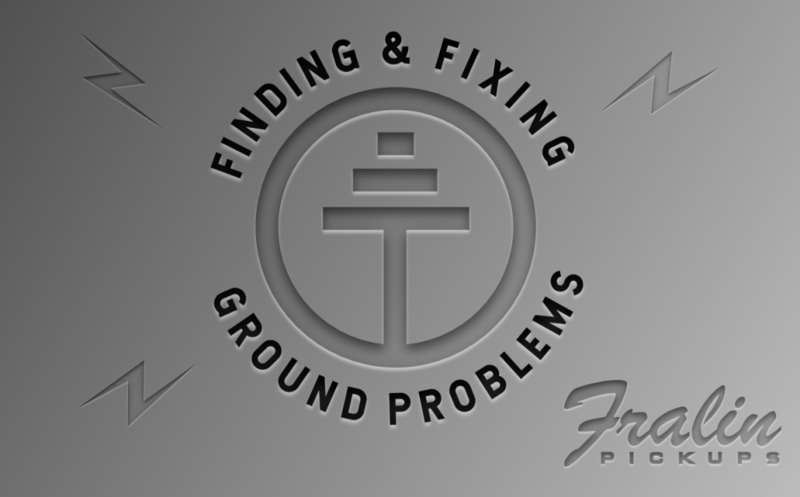 Grounding items multiple times creates a few problems. 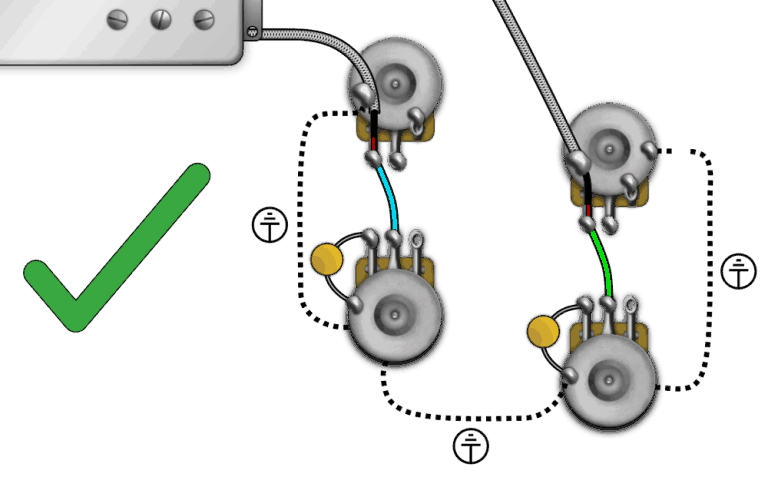 For one, using wire to ground a series of pots in a circle creates a one-turn coil. If you’ve checked out our article on humbuckers, then you know that EMI usually enters the coil, not through the magnetic field. Creating a loop of ground connections will introduce noise into your signal. Take a look at the following images. 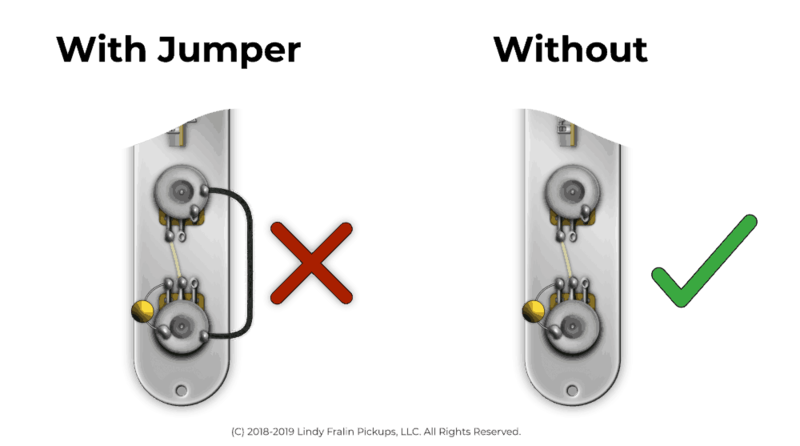 You’ll see an incorrect and proper way to ground a Gibson Les Paul®. This is the incorrect way to ground a Les Paul or Telecaster Deluxe. Adding an additional ground wire completes a Ground Loop, introducing noise. This is the correct way to ground a Gibson Les Paul or Telecaster Deluxe. Keeping a “Horseshoe” shape, each pot is grounded once. Grounding your strings is essential for having a quieter guitar. If you’ve ever noticed your guitar’s noise get quieter when you touch the strings, you might have thought your body grounds your guitar’s parts. You’d be wrong if you did. It turns out, a human being makes a pretty good EMI (Electromagnetic Interference) antennae! Your body is an antenna for all sorts of EMI, so when you touch your guitar strings, the guitar is grounding you! Pretty cool, right? “Star” Grounding: Good Or Bad? Star Grounding refers to the method of grounding that connects all grounds to a Single Point. For example, think of the back of a Strat Volume Pot: It tends to be a central hub for ground connections. Some electrical engineers state that Star Grounding doesn’t make a difference, but Lindy prefers this method. His reasoning? All ground connections connect to the output jack sleeve anyway. Also, it’s harder to create a ground loop by practicing Star Grounding. Connect everything, But Connect It once. 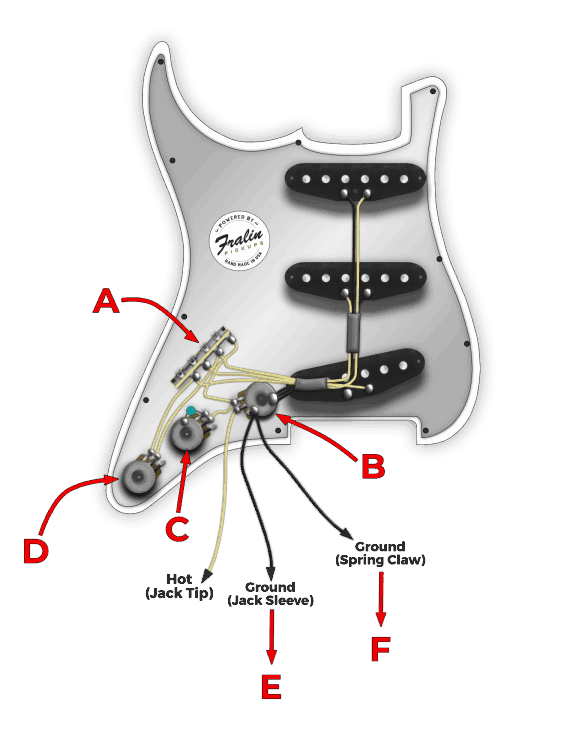 Take a look at the following image of a Strat – notice how each part connects to ground once. Notice any jumpers? The Shielding on the back of the pickguard is connecting everything. If you were to add jumpers between pots, you’d be creating a “Ground Loop,” and introducing noise into your circuit. This is a method of “Star Grounding”. You can see that the Volume Pot is more or less a central hub for all points of ground contact. Adding more ground jumpers to the parts will create more ground paths, and introduce noise. However, there’s one main output – the Output Jack’s sleeve. If your pickguard does not have shielding: you’ll need to add shielding or jumpers to ground your guitar’s electronics. A lot of grounding mistakes come from not checking your surroundings. If your parts mount to a metal plate or shielding, chances are, they are already connected electronically. In this situation, running extra jumper wires would only over-ground your electronics. The Telecaster Control Plate pictured below is connecting all electronics. 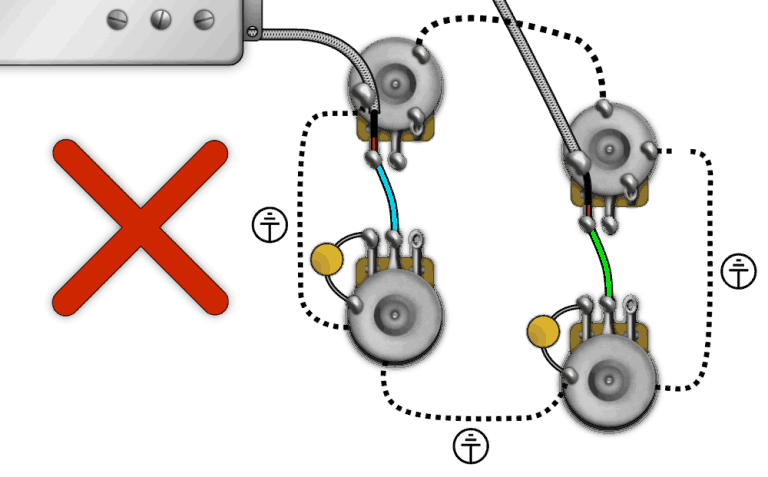 By connecting only one ground wire from the Volume Pot to the Output Jack, you ground your parts thoroughly. If your bridge pickup’s screws thread into the steel plate like ours do, then that should be enough to ground out your strings, since the steel plate connects to ground. Furthermore, double-check to make sure there are no stray ground wires wedged under the Saddle Plate. With your guitar’s electronic cavities open, turn your multimeter to the D.C. Resistance setting, about 20K. Use the free terminal to touch every metal piece, and pay attention to the reading of the Multimeter. 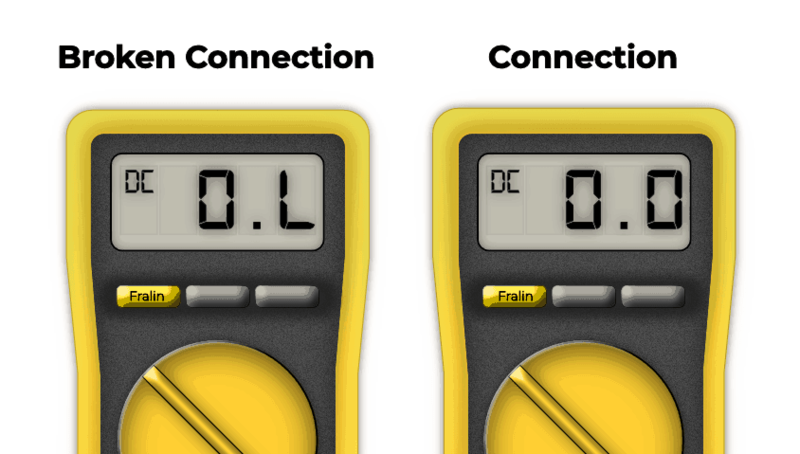 If your Multimeter reads “0.0”, you have a solid connection – there is zero resistance between the two parts. If your Multimeter reads “0.L”, you have a severed connection, and this is at least one of your problems. You’ll need to run a ground jumper to make sure the part gets appropriately grounded. Note: Make sure you perform this on every part of the guitar, including the Bridge, Switch, and Output Jack Sleeve Tab. Note 2: If everything checks out in your guitar, start looking at your cable. Check to make sure that your cable’s sleeve is correctly attached to ground. Lastly, Note 3: If you have Shielding or Conductive Paint, make sure that there is a connection to ground. That should just about do it for now! Grounding is very simple: make sure everything is grounded, but only once. Don’t overthink it! Tyler is an avid guitar player for over 20 years - he spends his time editing and maintaining the website, designing graphics, writing articles, and designing ads. He's powered by Vietnamese Food, Hiking, and Beer. Sounds frustrating. Definitely sounds like something is not grounded properly – do you happen to have a metal pickguard, or conductive paint? I installed a lace sensor gold in my acoustic. Single volume to jack. Easy right? Well there is a buzz that will not go away no matter what i try. Properly wired and grounded. White green tied and grounded and orange to hot. All good but still a buzz. Any ideas? Ive done this many times and never had this problem.